E.30 What is aluminum rhinestone which used for clothes ? What is aluminum rhinestone which used for clothes ? Q: what is aluminum rhinestone ? They are used for making pattern design on the clothes,they bulge out and have facets,they are round and with many colors. 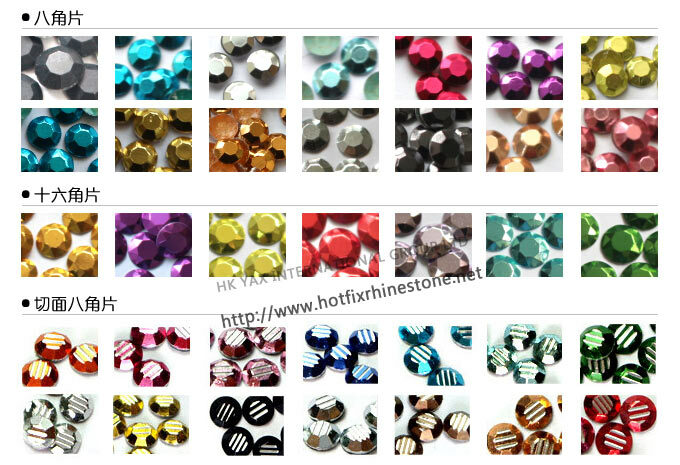 A:Aluminum rhinestone is rhinestud, also called hot fix stud,iron on rhinestone,or transfer rhinestuds. Aluminum rhinestone is made to be rhinestone shape by press forming technology,the professional item is hot fix rhinestud. The name of aluminum rhinestone and glass rhinestone are named by their material. Technically speaking,it needs apply glue on the aluminum flake at first,then produced by press forming method, its technology is simple and quick. However,the technology of glass rhinestone is much more complicated.Smelting glass at first,secondly,grinding the glass facets,after that,it need paint on the bottom and paint,finally apply glue on the back. Aluminum rhinestone is very popular by many garments factory as its price is much cheaper than glass rhinestone,the weight is lighter,it is easier than glass rhinestone,nailhead,convex,resin rhinestone to be processed into hot fix motif. The hot fix rhinestuds are fixed place by hot fix tape after finishing motif pattern design,then put the hot fix tape stick on the place where you want to iron and iron on it by heat press machine.